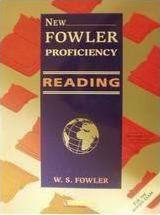 New Fowler Proficiency Reading provides comprehensive coverage of each part of the Reading Paper in the revised Cambridge Proficiency examination. The themes of the passages reflect those indicated by the examiners as of the most importance and are idenctical with those chosen for New Fowler Proficiency Listening and Speaking. If the books are used in conjuction with each other, the essential vocabulary required can be consistently recycled. Γράψε μια αξιολόγηση για το New Fowler Proficiency Reading και βοήθησε σημαντικά τους άλλους χρήστες!